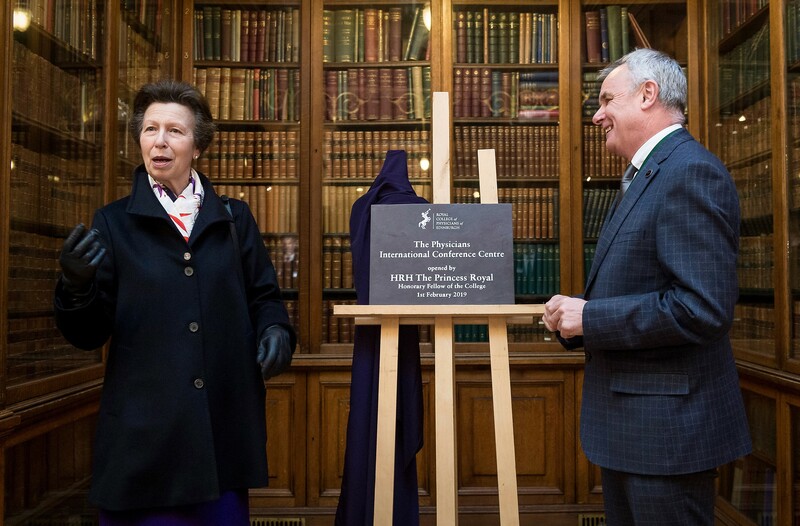 The redeveloped Physicians International Conference Centre at the Royal College of Physicians of Edinburgh was officially opened today (1 February 2019) by HRH The Princess Royal. Costing £3.5million, the conference centre redevelopment transforms the event experience for delegates and visitors, creating Edinburgh’s newest and one of its largest city centre conference venues. It is an honour to welcome HRH The Princess Royal to our wonderful, refurbished conference centre. We are particularly proud of our new facility – refurbishing any building is a complex task, but more so when the buildings in question are nearly 300 years old. As an Honorary Fellow of the College, it is very fitting that Her Royal Highness should open what is a new chapter in the long and illustrious history of this great Edinburgh institution. It is exciting for us to be able to show off our wonderful new facilities to such an honoured guest, and Her Royal Highness took the time to join the conference that was running as well as meet a few of the poster exhibitors. We are now looking forward to working with these new facilities and opening them up to as wide an audience as possible. Located in Edinburgh’s New Town, The Physicians International Conference Centre at The Royal College boasts one of Edinburgh's largest auditoriums and a range of modern and historic meeting rooms. The auditorium can host up to 300 delegates and is equipped with state of the art audio-visual and teleconference systems. 1. The College also runs as a venue, and has a suits of rooms and conferencing facilities available, from grand Georgian to ultra-contemporary https://venue.rcpe.co.uk/.